Napa Valley Winery Bottle Lamps. These beautiful repurposed wine bottle lamps blend illumination with the instant appeal of the wine bottle. These lamps are really a joy to behold and give instant atmosphere to any space. Holding promise as a great centerpiece for any interior, be it residential or commercial, these beautiful wine house bottle lamps are also beautiful when hung in groups over a dining table or counter. Perhaps the most perfect pendant light fixture for a wine bar or wine tasting room as well. These wine bottle pendant lamps are also a favorite among interior decorators because they go with just about any kind of interior design. 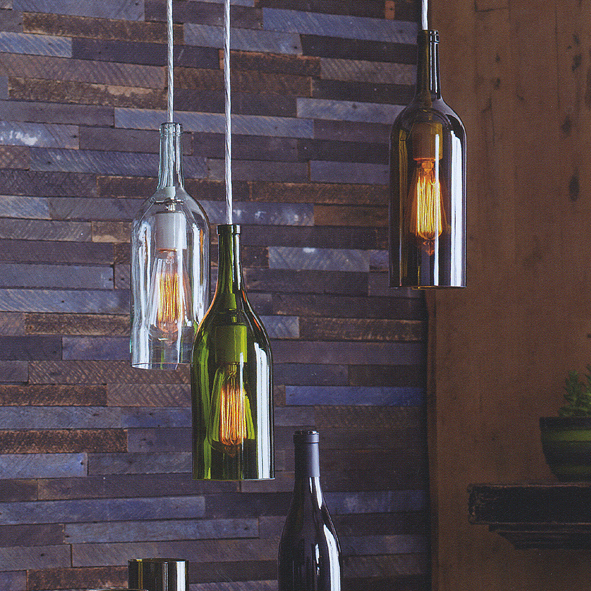 Our wine house bottle lamps feature a 10' clear electrical cord with a plug end. Each lamp includes our large filament Edison-style light bulb as pictured. Select from from either transparent clear, bottle green or olive brown. Made with UL listed components.